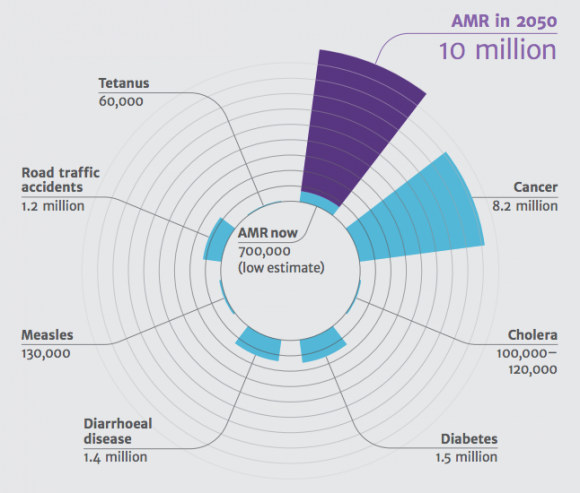 An economist crunched the numbers on the rise of antibiotic-resistant "superbugs," and what he found foresees crisis in the very near future. If left unchecked, he warns, the cost, in loss of both global wealth and lives, would be truly astronomical. 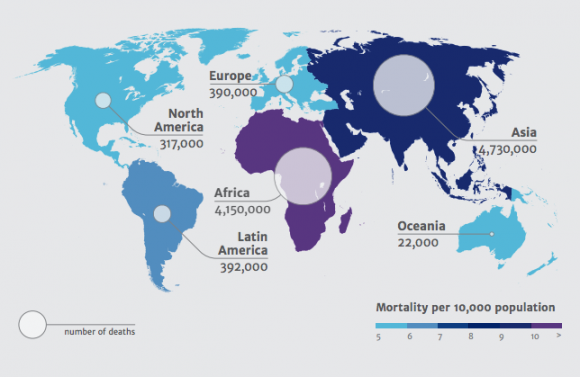 The biggest killers, the report finds, will be drug-resistant E. coli, malaria and tuberculosis. The economic toll, meanwhile, can surpass $100 trillion by 2050, reducing world GDP by anywhere from 2 to 3.5 percent. And the team emphasizes that this is likely an underestimate -- it fails, for example, to take into account the cost of healthcare should antibiotics no longer be effective, and doctors were no longer able to perform Caesarean sections, chemotherapy or transplants. The problem is a global one, economist Jim O'Neill, who lead the analysis, told the BBC, with some countries facing greater catastrophes than others. At the most severe end, in Nigeria, drug-resistant infections could be responsible for more than one in four deaths. In India, where antibiotic resistant infections are already taking a devastating toll on newborns, an additional two million lives could be lost every year. None will be left off the hook, however. North America and Europe, which together already see about 50,000 such deaths each year, could soon see that toll soar about 700,000. The report is the first to come out of a larger review introduced this past July by U.K. Prime Minister David Cameron, which aims to put the growing crisis in a global context and highlight the need for an international plan to regulate the use of antibiotics and find ways to encourage the development of new drugs. “We cannot allow these projections to materialize for any of us," O'Neill said in a statement. Indeed, the report asserts that the crisis it foresees is by no means inevitable: "The cost of taking action can be small," it says, "if we take the right steps soon."